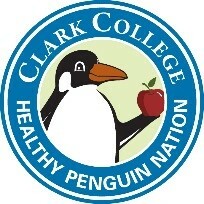 Registration: 9:30 a.m. - 11 a.m.
Walkabout: 10:00 a.m. to 1:00 p.m.
Clark College Business and Health Sciences Unit is hosting the third annual Healthy Penguin Walkabout! Community members and anyone interested in good health are invited to participate in this FREE event to stroll the beautiful campus and receive free health assessments. Participants will be able to walk the college's Penguin Pathway while enjoying fun learning activities for the entire family--including a "ninja warrior" obstacle course for kids in the O'Connell Sports Center. Organizers are collecting donations for the Penguin Pantry at this event. For every four items of non-perishable food or personal-hygiene items that you bring, you'll receive an extra raffle ticket! For questions or more information, contact Brenda Walstead at 360-992-2938 or bwalstead@clark.edu. This event is a part of the college’s focus on interprofessional learning for students in the college's Business, Business Medical, Dental Hygiene, Fitness Trainer, Health and Physical Education, Medical Assisting, Nursing, Pharmacy Tech, and Phlebotomy programs. If you need accommodation due to a disability in order to participate in this program please contact Clark College’s Disability Support Services Office at (360) 992-2314 or (360) 991-0901 (VP), or visit Penguin Union Building room 013.